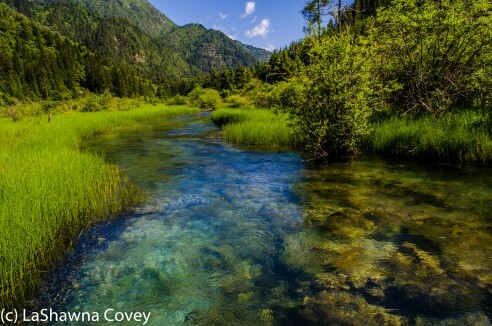 I had two days planned to visit Jiuzhaigou National Park, and intended to visit the most beautiful valley the first day. 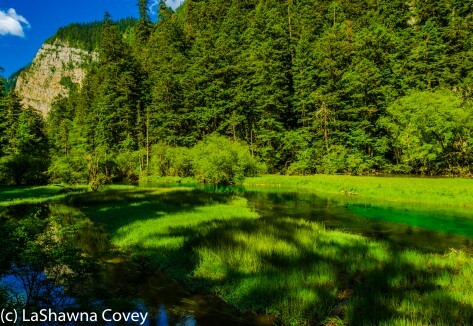 There are three valleys in the park, and two of them are considered the most beautiful. I originally intended to visit Ri Ze Valley and Shu Zheng Valley the first day, but due to circumstances (like my poor aching feet), I decided just to walk Ri Ze Valley, which is about 18km from start to finish. Like most of my vacation days, I started the day early. However, unlike most places I’ve visited, an early start did not make me special or alone. Like I mentioned in a previous blog post, the line for breakfast started before breakfast even began at 0630. I intended to start early to maximize my time in the park, and hopefully beat some of the crowds. During the summer season, the park opens at 0700 and closes around 1800. I arrived at the park entrance around 0730, and the hordes of crowds were already milling around. My jaw sort of dropped at the number of tour groups, and I pictured a hideously long wait to buy a ticket and get on the bus. I was somewhat pleasantly surprised that the line for tickets didn’t appear QUITE as bad as I feared. Sure, people were just crowding around all the registers, but it only took me about 10 minutes to get a ticket. Price for one day admission is 220 yuan, plus the 90 yuan for a bus ticket, so one day in the park costs around roughly $50 USD. It’s certainly not cheap, especially in China, but I personally felt the price was worth it. I mean, I spent several hundred dollars in plane tickets and a hotel room, all to see as much beautiful nature as possible, so why would I quibble about $50 USD per day? This high price is during peak season, but during the winter, the one day admission drops to 80 yuan per day, and a second day ticket for 20 yuan. There were many people at the bus stops, but there were so many buses, that it only took me about 10 minutes to get on a bus. Transportation in the park is a well-oiled machine, set up to transport hundreds of visitors per day as quickly and efficiently as possible. Once you get past the entrances, there are two lines for buses. Initially I assumed that one side takes you to the start of Ri Ze Valley, and the other one takes you to Ze Cha Wa Valley. However, as I figured out the second day, that is not the case. There are buses that go to both destinations, but they aren’t separated. The destinations are surely listed on the bus, but since the words were in Mandarin, I had no clue. I just got on a bus and hoped for the best. Luckily for me, I got on a bus for Ri Ze Valley. The morning buses take visitors directly to the end of the Ri Ze Valley where the trail starts. The ride itself takes around an hour, and you pass by all the beautiful sites that you will see again on your way back. The final bus stop, or technically first stop of the day is the Primeval Forest. Immediately once I got off the bus, I felt two things: the bracing chill in the morning air, and the altitude. This part of the valley is over 9,900 feet in altitude, and I felt that vague lightheadedness that comes with altitude adjustment. The morning was clear and sunny, and the air very fresh. The vast majority of visitors got back on the bus after visiting the Primeval Forest to head back down the valley and stop at all the key sites. I, on the other hand, intended to walk my way out of the valley, which is about 18 kilometers in length. If you have only one day in the park, but want to see as many of the key sites as possible, you really can only ride the bus and stop at all the key sites for pictures. 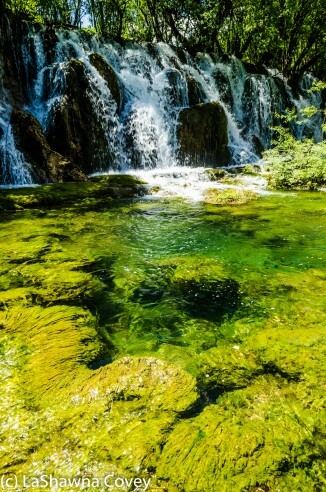 However, visiting two days enables you to see more of the park at a leisurely pace and walk to all the beautiful sites. 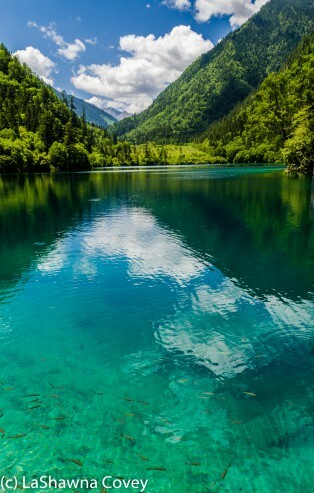 I chose to come to Jiuzhaigou to walk among the beautiful nature and I wanted maximum amount of time to enjoy it all. This park is exceptionally well designed in my opinion. I’m not talking about the beautiful nature, because that just exists, though it is clearly well protected in this part of China. But the way this park is set up, it makes it really easy to enjoy. The paths through the valleys are all wood planked. Most of the path is flat, or some minor stairs, though the trail is always heading down as you descend through the valley. Also interspersed throughout the park are rather nice bathrooms (much better than many I have seen in US national parks), so this ensures the park stays very clean. There are also numerous signs in English, so you know where you are, how far the next sight is located, and where the nearest bus stop is. The first few kilometers were in relative peace, as there weren’t that many other walkers. 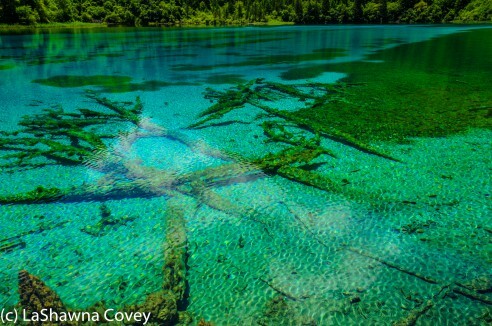 The first sites to visit were Grass Lake and Swan Lake. 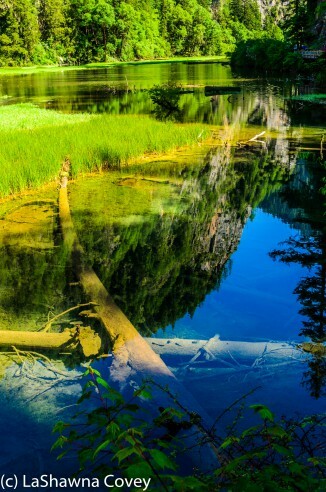 Grass Lake is a long, narrows, semi-swamp tucked under deep cliffs. Swan Lake is also tucked among dense woods. 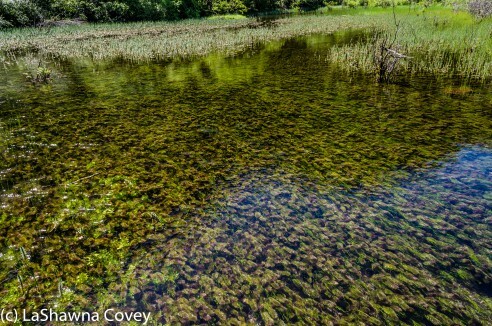 I was struck by all the different plants that seemed to thrive under flowing water, and I hadn’t seen anything quite like this before. 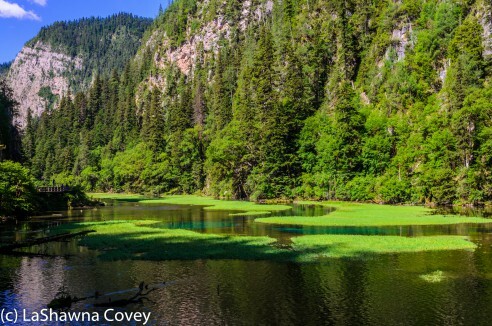 I had intended to walk the entire 18 kilometers, but the trail after Swan Lake was blocked, and I had to take the bus to Arrow Bamboo Lake, but I didn’t miss anything exceptional on the trail, and saved some time, and saved my feet. 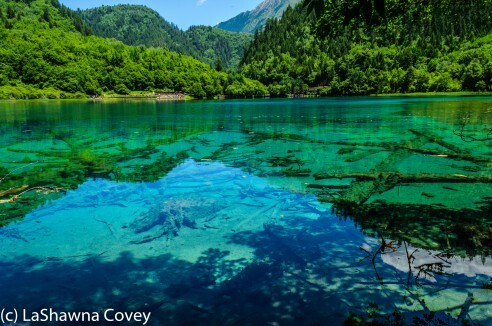 Once I arrived at Arrow Bamboo Lake, I was in for a bit of surprise. By this point, it was mid morning, and the tour groups were out in even greater force. So instead of the peace and quiet I had up on the upper part of the trail, now I had noise and crowds to contend with. Even though this is a place where independent travel is certainly possible, for the most part from what I saw, most people were there as part of a tour group, and these groups tended to be very large. So I did my best to block out the crowds and step around them when possible. The beautiful nature made me want to just sit back and take it all in, but that can be a bit difficult at times. The crowds had no compunction about pushing me aside or asking me to move so they could take the umpteenth picture of themselves posing like models. It can get a bit much at times if you don’t like crowds, which I don’t, but honestly, the beautiful nature was worth it. Wait long enough and the crowds will eventually go away (of course only to be replaced with another crowd shortly thereafter). But you can set your own pace and see what you want for how long you want, and there is more than enough time to see it all if you visit the park over multiple days. After walking around and admiring the serene Arrow Bamboo Lake, I came upon the first of numerous waterfalls in the Ri Ze Valley. Arrow Bamboo Waterfall seems to be the smallest waterfall in the valley, being only around 7 meters high. This waterfall was formed from collapsed rocks, and is arc-shaped with a wide span. 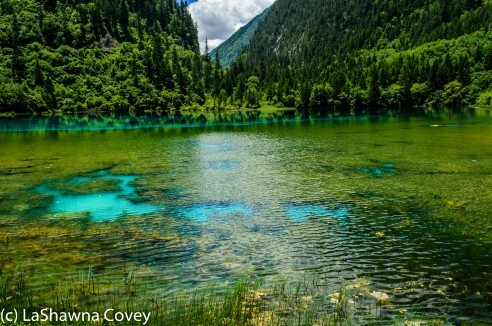 Continuing down the trail, the next stop of beauty was Panda Lake, with its very transparent water surrounded by mountains. You might think that seeing a multitude of lakes and waterfalls would get boring, but I never found it to be so. 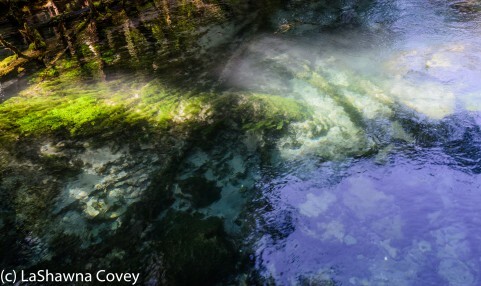 The national park is pristine, and the colors are bright, and I am very drawn to bright colors. The full visual power of this park is very apparent on a sunny day, like this day was. 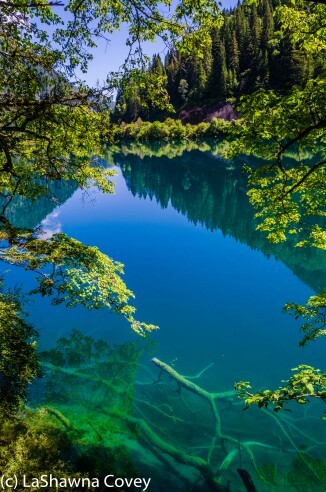 The blues of the lakes are jewel-toned, and the water is so transparent, it is like a mirror reflecting the landscape around it. Right next to Panda Lake is Panda Lake Waterfall. 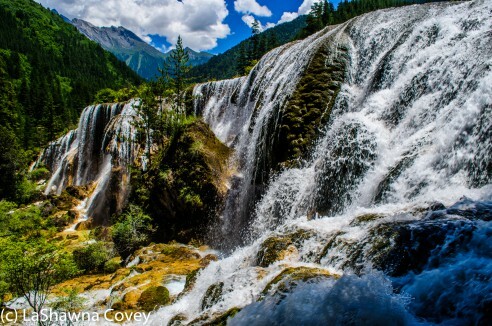 This waterfall is the highest and oldest of Jiuzhaigou’s waterfalls, and it has been forming itself slowly over the past 53,000 years. The sight of the waterfall is majestic, and I’ve read that that the waterfall freezes in the winter to form a solid curtain of ice. 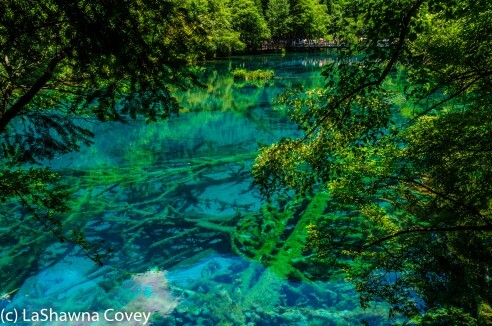 Five Flower Lake is considered to be one of the most beautiful and colorful of the park’s lakes. 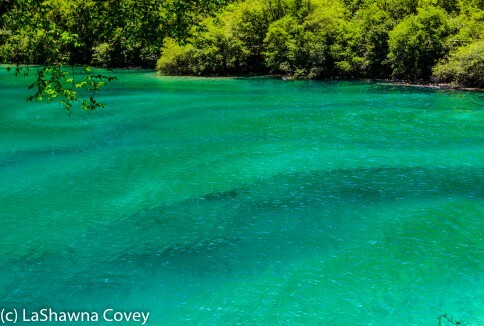 The wide variety of colors are formed from the lake bottom travertines and colorful algae. The park in the summer is filled with all range of green and blues, and I kept imagining what this park looks like in autumn, with all the reds, oranges and yellows. Walking along the path, I just kept coming up on more beauty, more lakes, and more waterfalls. 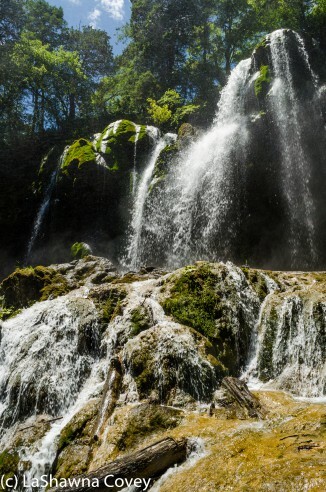 The head of the final waterfall in Ri Ze Valley is the Pearl Shoals. 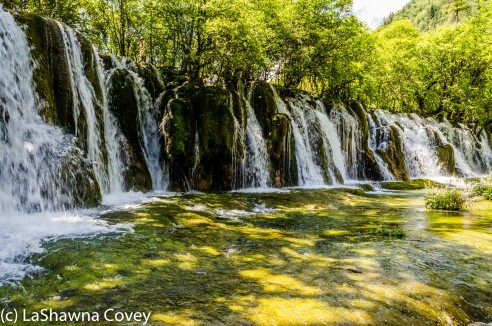 I hadn’t seen anything quite like it, with the wide, shallow river flowing and bubbling over the travertine surface among the trees and shrubbery. 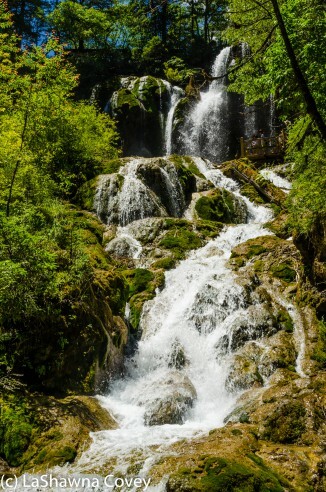 These shoals consolidate into the Pearl Shoals Waterfall and form a gorgeous, rushing waterfall. This waterfall is considered the most photographed waterfall. It is gorgeous from all angles, particularly the side view as I descended the path. 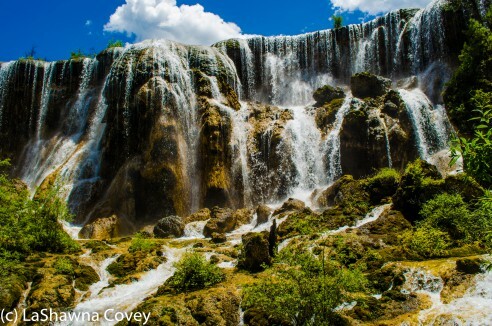 I have seen many waterfalls in my travels, but I personally think the waterfalls in Jiuzhaigou National Park are some of the most unique and beautiful waterfalls I have ever seen. Many times it felt like I was in some sort of fantasy, fairy land, and I had to remind myself that this was real life, a real place on Earth. I had originally intended to walk both the Ri Ze Valley and Shu Zheng Valley that first day. I figured it was only 20 miles, and I’ve done more. 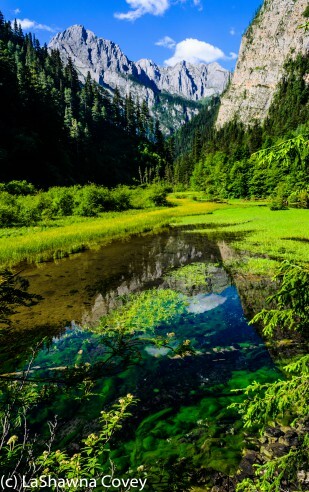 However, once I reached the end of Ri Ze Valley around Mirror Lake, I realized my body had culminated. The walking was not difficult, since it is either flat or downhill. But I had been on my feet for around nine hours, the sun was hot and shining bright down on my head, and I was hungry (there aren’t really any restaurants in the park, and I didn’t bring a lunch, and was subsisting off the big breakfast buffet). 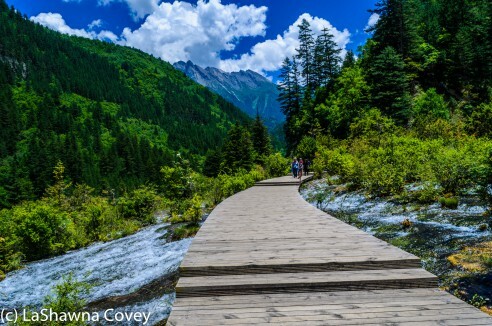 I called it a day and figured I would walk the Shu Zheng Valley the next day. I walked out to the nearest bus stop and gratefully caught the next bus down to town and gingerly walked back to my hotel for a well-needed shower and nap. 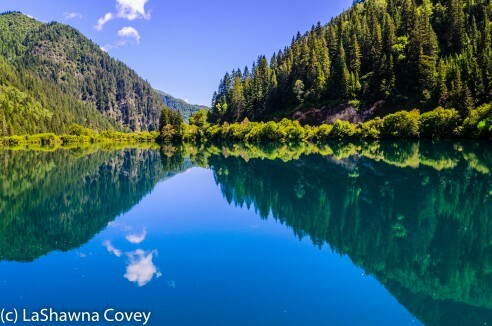 This entry was posted in Photography, Travel and tagged Arrow Bamboo Lake, Arrow Bamboo Waterfall, beautiful nature, China, Five Flower Lake, Jiuzhai Valley National Park, Jiuzhaigou National Park, Mirror Lake, Panda Lake, Panda Waterfall, Pearl Shoals, Pearl Shoals Waterfall, Ri Ze Valley.